The markets have been on an incredible run over the last few years. It's easy to forget that just 8 years ago we were in a financial crisis. The crisis got so bad that people were actually making runs on banks and withdrawing all of their cash. Today, we've seen a complete 180 to what we saw in 2008/2009. Markets are at all time highs. Volatility doesn't seem to exist anymore. New "stock tip" websites pop up everyday. People are depositing money into their brokerage accounts as quickly as they can. Times, for lack of a better word, are good! I ask 1 simple question. Is this as good as it gets? According to the above data, American consumers see a record 65% probability that stock prices will be higher 1 year from now. This is the highest reading on record. People are optimistic. The S&P 500 has gone 449 trading sessions since its last -10% draw down. This is a pretty impressive streak. -10-20% draw downs are crucial for the stock market as they flush out weak hands and enable the markets to continue higher in the long run. When we see streaks like this one, it makes me cautious, because it conditions people to believe that every -2-5% decline is to be bought. This creates lots of "weak hands" who will be the last ones to sell during an extended down turn. The VIX hasn't been above 20 for 238 consecutive trading sessions. Excessive spikes in the VIX are a must, as that provides you the opportunity to outperform common government bonds in the long run. If we never saw the VIX spike into the 20's, 30's, or 40's, then we would essentially get the same returns as investing in a 30 year bond. 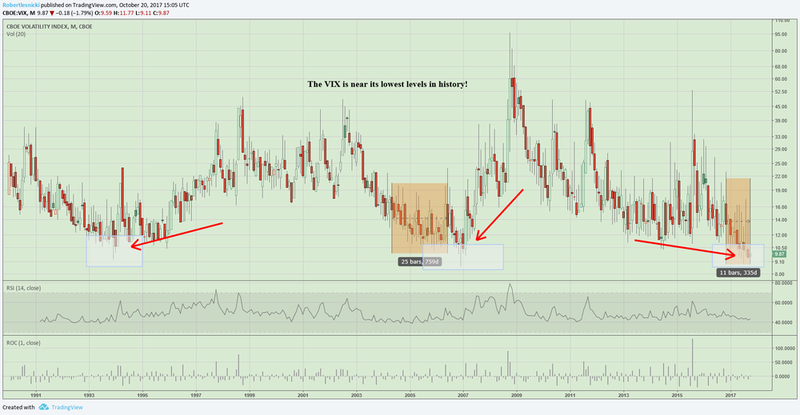 This lifetime monthly chart of the VIX is quite interesting to me. It shows that we're trading near all time low levels. Each time we've seen this in the last 25 years, a massive spike resulted not too long after this occurrence. Pay attention! So does this all mean that the stock market is going to crash tomorrow? No, but investors should probably pay attention to some of this stuff so they're not blind sided, should a -10-40% down turn ever happen.